As I was helping my son pack for his camping trip to Devil's Lake this past weekend, we were rummaging through the camping bins when he came to a bin with my High School yearbooks in it. He looked through a couple to find me and after that he came to something I'd forgotten I kept. 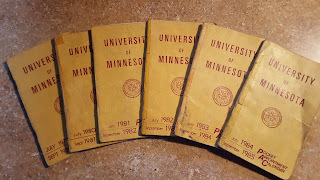 It was six years worth of my Pocket Appointment Calendars from my days at the University of Minnesota. Why six years worth you ask? Well, I was part-time for a while, changed my major a time or two and added a double major near my Junior year. But that aside, the bigger question is, why did I keep these? 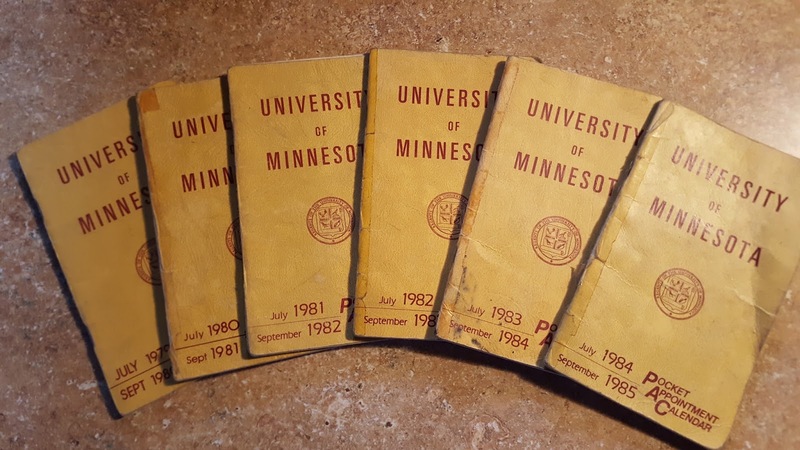 It has been 31 years since I graduated and the fact that I not only kept them, but moved them to about a half dozen residences is even more puzzling. 1979-80: In the Identification section I include my name, address and phone as well as emergency contact. Under Medical Information I list my Dr. as "Seuss" and my blood type as "B or A." In the 1980-81 book I get more specific with my blood type and declare it as "B" which is great, except that my blood type is actually A positive. When you're young, these things don't matter as much as when you're old, obviously. 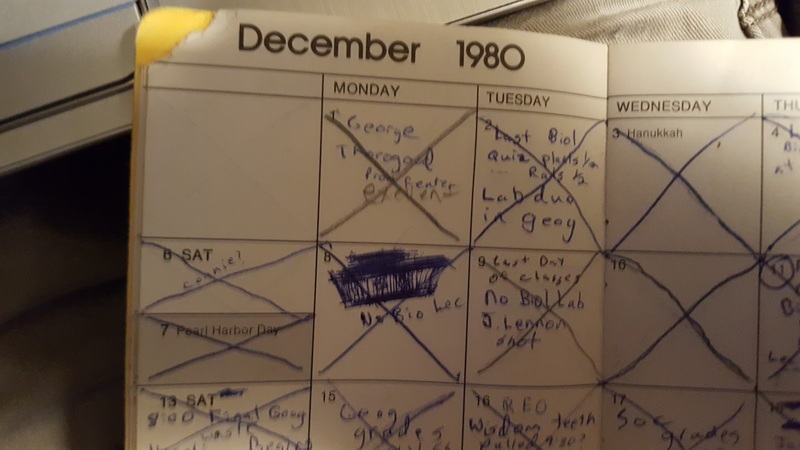 1980-81: I have December 9th penciled in as the last day of classes, and right underneath it I wrote, John Lennon shot. A dark day for sure. 1981-82: Because I was such a music freak, most of my books have the dates of various concerts I attended. 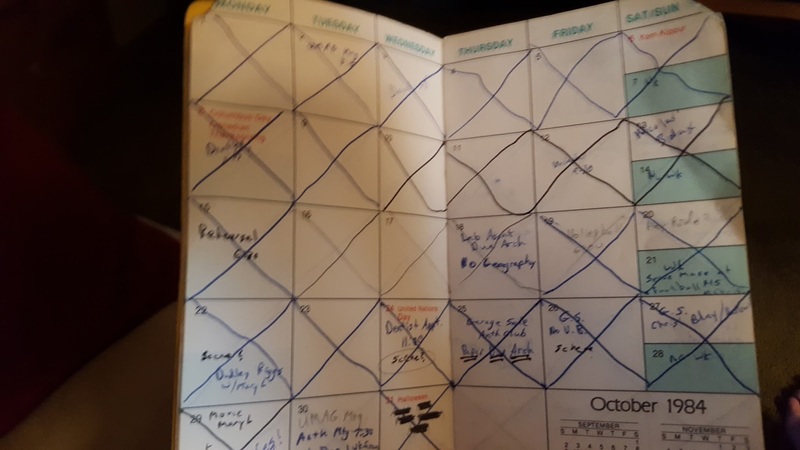 One notable one penciled in was November 21st, 1981 when I saw the Rolling Stones. I had main floor seats for their Tattoo You tour. Mick and the boys killed it. 1982-83: I marked "Nicky's Baptism" for December 5th, 1982. Nick is my godson and if you would have asked me what month, let alone what day, he was baptized on, I wouldn't have had a clue. Well, it was a Saturday in December, 1982. So, there ya go. 1983-84: This was when some of my friends started to marry off. Most were graduated from college and had had steady girlfriends/boyfriends for many years. I have Peter and Beth both getting married a month apart in June and July. I wouldn't marry for another six years. 1984-85: By this time I was a part time student, and also President of the Anthropology Club which is a much more important title than the title would dictate. LOL. 1985-86: Evidently I dated a Karla a couple of times in the spring of 1985. I can honestly say, I have NO memory of Karla. How does that happen? I don't know. My college years created some of the best memories of my life. I will always remember them as being very rich. These little glimpses into those years help remind me how lucky I an to have had the experiences I did. And to Karla, I'm sorry.